Rahul Dravid's surprise exclusion from the team for the first two one-dayers of the upcoming series against Pakistan on Saturday generated sharp reactions from former international cricketers, who termed the decision as "unfair". Dravid, who has played 333 ODIs and scored 10,585 runs at an average of 39.49, has been out of form for quite some time but his omission appears to be too harsh considering his track record. It was all the more baffling since Virender Sehwag was given a prolonged run to regain his form when he was going through a lean period under Dravid's captaincy. Former India coach Madan Lal declared that it was "not a right decision" by the selectors. "This is Indian cricket. How can you drop a player who has played for last 10 years for you. When you play for such long period you get bad phases and it was just a few bad innings for Dravid," he told PTI. "Moreover, Dravid has not played at number three, which is his slot, in the last 10 innings. He is playing at five or six. How do you expect him to get runs after coming so late in the order," he said. "To get back into form you don't need rest, you need matches," he added. Former wicketkeeper Sayed Kirmani also blasted the selectors for the decision. "It is unfair. If this is the benchmark to drop the player of Rahul Dravid's calibre, then it should happen to Sachin (Tendulkar), (Sourav) Ganguly and rest of the guys also if they fail in three-four innings. The same rule should apply to all of them," he said on a television channel. Former Pakistan captain Inzamam-ul Haq also expressed surprise at the decision and said it would benefit Shoaib Malik's team in the series. "Pakistan will get an advantage as Dravid is out of the team. 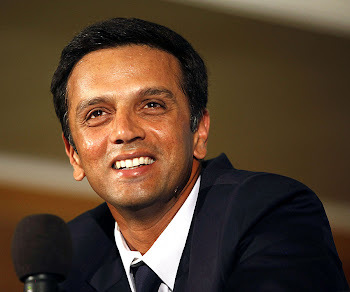 If a famous and experienced player like Dravid is in the team, juniors can learn a lot from him," he said. G.R. Viswanath: I feel really bad for Dravid, not because he’s from Karnataka but because he’s truly one of India’s greatest cricketers. I have been reading the papers and I think it is very unfortunate for Dravid. But such things have happened in Indian cricket from time immemorial and continue to happen. The selectors seem to have forgotten Dravid’s contribution to Indian cricket. He has a tremendous aggregate with over 10,000 runs under his belt. You can’t treat a cricketer with such statistics like that. This only shows there is something wrong somewhere in Indian cricket. I have never commented on this episode and I feel very sad for him. I can only imagine how Dravid is feeling at the moment. Brijesh Patel: I think it is shocking! He’s the most dependable Indian player and he’s an ideal team man. If he was selfish he would have stuck to batting at his strongest position which is number three. But he served the cause of the team and batted at different positions. The shuffling around has certainly affected his form. Just look at his record against Pakistan and you will see what he’s capable of. He would have been an ideal foil against Pakistan.